According to Hindu mythology, our body system consists of seven chakras which control our body organs, different types of glands and are responsible for the uniform distribution of life energy through them. And if in case any of it gets disrupted, then it might lead to internal body issues related to health and mental problems and much more. 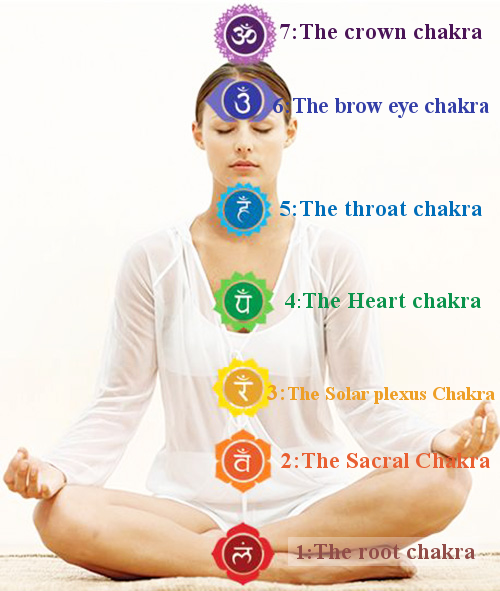 Now you might be thinking that what is a chakra and how it controls our body system? So let's dive into it and discover our body chakras. Chakra ("cha-kra", ch-a center of energy) is basically a circular wheel shaped vortexes of energy distributed equally on seven different points on our spinal cord. It forms the energy ecosystem of a body. Any kind of blockage in the ecosystem may create a devastating effect in human body. The concepts of chakras are found especially in Hinduism, Jainism, and Buddhism.It is differently stated in every religion as in Hindus (counted as seven chakras), and in esoteric Buddhist (counted as four chakras). Each chakra has its own vibrational frequency and a unique color, which governs its own specifications. The first chakra among the seven, known as the Mooladhara chakra which is a combination of Sanskrit words "mool -root "and "Dhara-support". It is a support system of all the chakras from the base and helps in the foundation for expansion in life. It is a cone of energy forming a base at the spine and slight goes downwards. It is located at the base of the spine. •Support and forming the foundation of living our lives. To sum it the root chakra is all about the safety and survival of human life. The sense of smell is linked with the root chakra. A rich vermillion red color represents the root chakra which symbolizes the sexuality, physical strength and as well as for the need to have prompted responses in case of danger. The red color is used to fill the petals of the lotus flower indicated as its symbol. In case of blockage of the root chakra, the person might feel unsafe in the world and everything in front will look like a potential risk for him. He might face some eating disorders, excessive negativity and much more. Also known as Swadishtana Chakra is the second chakra among the seven. It represents the emotional, creative and sensual side of a person. It relates to the water element present in the human body and its energy is characterized as the most flexible one. It is located at three inches below the navel, just at the center of your abdomen belly and at the back it is positioned at the level of lumbar vertebrae. The major characteristics of sacral chakra is linked with the psychological and behavioral functions ? The sacral chakra is associated with the sense of taste glands. The female reproductive system, lymphatic system, large intestine, bladder, pelvis etc. are some glands and organs impacted by this chakra. It is commonly represented through orange color which is transparent and translucent in quality. It impacts sexuality, compassion and joy for others and even creativity. In case this chakra gets imbalanced then the person gets stuck in a particular mood, lack of sexual desire can be faced or overruling of emotions and can even face overindulgence in sexual fantasies. The Mani Pura chakra which is a translation of "city of jewels". It relates to the individual's professional success, mental ability and progressive nature of one's own. As the sun radiates itself in the whole universe, this chakra also helps the individual to radiate his power in the world. The third chakra is positioned at the upper part of your belly where diaphragm rests. The sense of sight and adrenal gland is associated with the chakra. It is indicated by yellow color which depicts the association of this chakra with fire, charge, and energy. This energy when balanced, then the person feels more confident, cheerful and energetic with respect for himself and others around him. If it gets blocked then the individual could feel aimless, directionless or with lack of purpose. Also known as Anahata chakra which aims to fill the life of an individual with love, care, compassion, and beauty. This is the fourth chakra which revolves around the earthly and spiritual aspirations of oneself. Through heart chakra, you can easily feel the harmonious exchange of vibrations among people and can appreciate the beauty around you. It is associated with green color. The sense of touch is impacted through heart chakra and the glands which are affected are thymus and lymph. Whenever it gets blocked you might feel anger, jealousy, insecurity, excessive isolation and dependency. As the name suggests, the throat chakra is linked with our voice and communication. Its Sanskrit name is Vishudda means purification and is also related to an element of sound. It is located at the level of the throat and it should be remembered that it is multidimensional as linked with mouth, jaws, neck, and shoulders. It gives emphasis on projecting your ideas and thoughts to the world. It's blue in color. And the glands linked to the throat chakra are ears, mouth, jaws, neck, esophagus, teeth and neck vertebrae. When it gets imbalanced the individual can manifest few issues as lack of control on speech, fear of speaking in public or not able to keep secrets. The third eye chakra is the sixth chakra also known as Ajna chakra, located at the forehead and between the eye where the brow meets. It is for intuition and foresight. It is made with the principle of imagination and openness. It is associated with the realm of spirits. a sense of thought surrounds it and pineal or pituitary gland is connected with it. The chakra color is indigo. If it is well balanced then the person has a charismatic personality and good telepathic abilities. The last and the seventh chakra at the top of your head. It helps the person to look beyond the personal occupations and visions. Also known as Sahasrara chakra. It is basically associated with our limitless thoughts and imagination whether personal or not. The color of crown chakra is white, although it can be depicted as purple. The imbalance of this chakra can lead to cynicism, disconnection with the spirit and overactivity of it can lead to disconnection with the body.